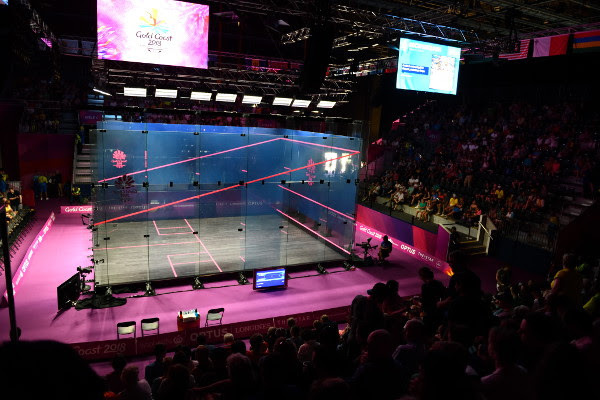 While Squash relished its sixth appearance in the Commonwealth Games since making its debut in Malaysia in 1998, hosts Australia together with New Zealand and England shared the gold medals in the five events at Oxenford Studios in Gold Coast – with New Zealand topping the medals table for the first time since 2002. 105 athletes from 28 nations, officiated by 27 referees from 11 Commonwealth nations, competed in some 140 Singles matches and 115 Doubles matches – the busiest and most successful athlete being Kiwi star Joelle King (pictured above) who compressed 15 matches into the period en-route to collecting two gold and one bronze medal. 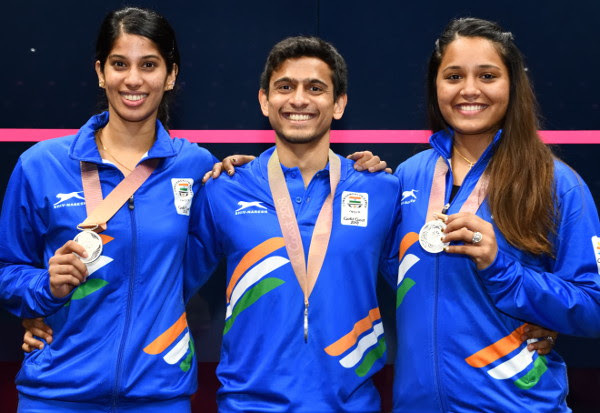 Athletes from India returned home with a best-ever two medals, while Malaysia celebrated its first men’s singles medal thanks to unexpected bronze medal success by Nafiizwan Adnan. Australian veterans David Palmer and Rachael Grinham, both aged 41 and former world number ones, also had much to celebrate. 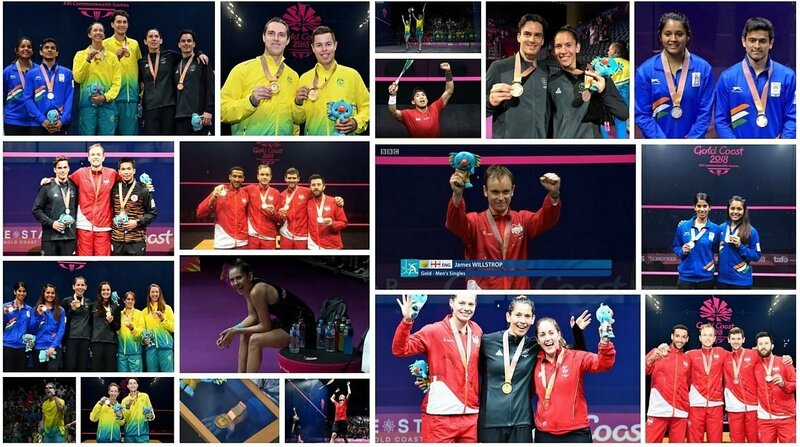 With a successful defence of his Men’s Doubles gold medal – this time in front of a packed and partisan home crowd, and with Zac Alexander, a different partner from 2014 – Palmer extended his tally over six Games to nine medals, more than any other squash athlete. 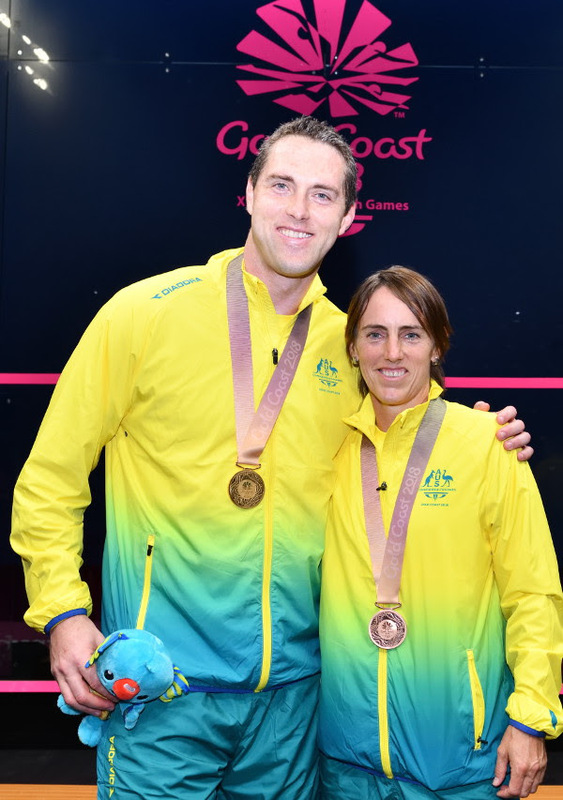 Queenslander Grinham (pictured below with Palmer) became the most decorated female athlete after a Women’s Doubles bronze took her total to eight medals, thereby maintaining her record as a medallist in each Games in which she has competed. 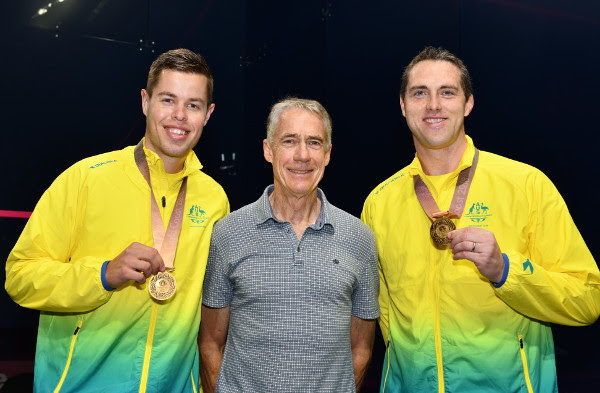 “It has been a great spectacle for the spectators and the sport as a whole,” said Squash Australia CEO Richard Vaughan. “It was great to see our players exceed expectations. It’s been excellent all round. The spectacular all-glass showcourt, plus the six side courts which can easily be converted to four doubles courts, will be moved to a new National Squash Centre as a legacy of the Games. Australian legend Geoff Hunt, the eight-time British Open and four-time World Open champion between the 60s and 80s (pictured above with Australian Men’s Doubles gold medallists Palmer and Alexander), was overwhelmed by the spectacle of the event and the unprecedented home crowd – some 2,500 spectators surrounding the glass court on all sides. “The great thing about a court like this (see below) is that you can see the squash from everywhere. You’ve got a good view wherever you sit. “I coached the Australian team in the 1998 Games. I would love to have been involved in my day as a player – but it wasn’t to be! “We were very disappointed not to get another gold in the Women’s Doubles, but our pair was beaten by the two-time world champions. “We’ve got such a small team. But it’s been a brutal week – Joelle’s had 15 matches and Paul (Coll) 14. “I was delighted to be involved in the historic debut of squash as head coach in the 1998 Commonwealth Games in Kuala Lumpur. “We did not earn any medals at the Games but that’s when we enhanced our long-term elite training programme to do well in the coming years. Nicol David went on to win gold in 2010 and 2014. “No other Malaysian had won a medal until Nafiizwan’s bronze this year. We are absolutely thrilled with this result and hope to better it the next time around. “I’m also pleased with all our doubles pairs as they put up creditable performances. We’ll be there with a vengeance at the next games I’m sure. 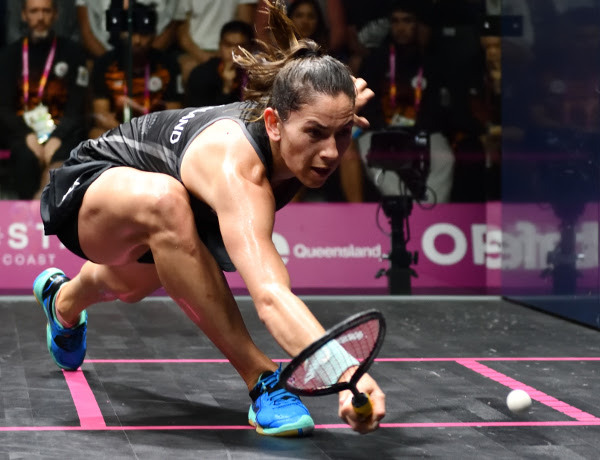 “When squash started its Commonwealth Games journey 20 years ago, the staging and presentation bar were set high in Kuala Lumpur – and it has been nothing but continued progress ever since. The spread of nations, the innovation on and around the court, superb broadcast and general sports presentation are general features that grow edition upon edition. “Here specifically, the wonderfully ebullient atmosphere generated by the spectators has been memorable – with our athletes responding to it; and the firm, fair and consistent standard of refereeing a standout too.